This year, we'll be racing in the Curtis Middle School auditorium, Sunday, February 1, 1998, using a brand-new track of our own, custom built for us by Piantedosi Oars of West Acton with high-precision electronic timing using infrared sensors by New Directions of Vienna, Virginia. Electronic timing means we can rank cars based solely on elapsed time. In the past, lacking electronic timing, we've had to use elimination methods, where a car advances to the next round only by winning each heat. The problem with elimination methods is that a fast car can be eliminated early on merely because of the misfortune of running against a slightly faster one. It's impossible using elimination to reliably identify more than just the top one or two cars without a dizzying number of runs to try every possible match-up. Also, there's always the possibility of complaints that the judges may have been mistaken in picking the winner in a particularly close race or that a car has lost only because it had the misfortune of running in the "slow" lane. 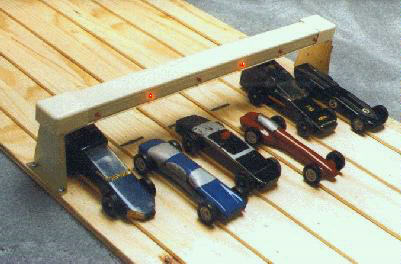 In our derby, each car will be run once on each of the four lanes. That's to avoid any complaints about differences between the lanes. Each car's time will be measured to the nearest 100 microseconds. At the finish line, the cars are typically traveling about 10 feet/second, so 100 microsecond resolution means we'll be able to tell the difference between cars separated by only .012 inches at the finish line. That's closer than the thickness of their paint jobs! The best 3 out of 4 times for each car will be averaged and compared against the averages for all the other cars to pick the winners. We'll drop the worst time for each car to avoid penalizing a car for the misfortune of one bad run. To keep the logistics manageable, each division (Tiger, Wolf, Bear, Webelos I and Webelos II) will run at a separate time. To ensure exciting, close races, each heat will match cars that are as close as possible in the standings, with each car in a lane it's not yet raced in. Even though we're measuring time, not number of wins, this means that if a car does win a given heat, it probably will move up in the standings. Each round will start from the bottom of the standings, working up to the fastest. The actual match-ups, results of each heat and current standings will be tabulated by computer. The day of the race, we expect to be using computer projection equipment so that live results, including the times turned in by each car and the current standings, can be seen on a large screen.